New home sales rose 27% in the month of March. 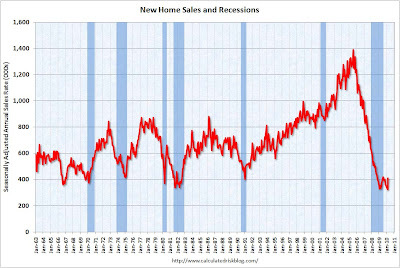 This coincides with a strong number for existing March home sales that we received earlier in the week. Some are cheering this as another sign of the housing bottom. Others view it as a one time surge of buyers trying to take advantage of the housing credit before it expires next this month. The Greece bail out is a three step process. Step 1 was for the IMF to commit funds, which they did 2 weeks ago. This happened a few hours ago when Greece finally surrendered their country. Their bonds exploded yesterday across the board bringing the country to its knees. The final step, number 3, is for the Eurozone to approve the bail out. This is where it gets tricky because of Germany and politics. Their politicians do not want to appear to be helping another country at the expense of their own citizens. However, a Greek bankruptcy would trigger massive losses in their banking system (think subprime) and create a contagion effect throughout Greece. It will be a very tricky and bumpy ride moving forward. Germany does not want their banks to fail, however, they know they would benefit from European turmoil because it would hurt the value of the Euro currency. As the currency loses value it benefits their export driven economy. While the public focuses on the Greek news on television every day, the large investment power players have already moved on. If you follow the number of notional Credit Default Swaps over the past few weeks, it shows that the major activity has moved away from Greece and is now centered around Portugal, Spain, and even France. The Credit Default Swaps are insurance contracts that are bought to protect investors against bond failure. If a country begins to lose credibility the cost to insure it goes up, and the investors who bought CDS contracts early make a fortune. It is laughable that the media is focused on Paulson's bets from 2006, when the same exact event is happening live today, only the hedge funds are attacking European countries. You can imagine the CDS investors as a bee swarm that move from host to host, attacking. When they have destroyed their current target they then move on to the next. After their attack they take their profits and the host country needs an immediate bail out with printed dollars. The bee swarm is expected to move swiftly through Europe destroying everything in its path before moving on to either the UK or Japan. Astute investors watching this happen ultimately believe their final target will be the United States. They will first attack the local municipal (state government) debt, before moving on the the largest target in the wilderness: the US Federal Debt. They will break they country state by state, weakening it, before taking down the body. Of course, it is not the bee swarm's fault that countries are failing. If governments ran a balanced budget their swarms would be unsuccessful. It is just nature taking its course. The free market working. It is incredible to watch it all take place. You will hear nothing about this story from the media. They are focused on the stock market rising and the Goldman Sacs story from 4 years ago. When I think about global markets, my goal is to try and imagine all investment opportunities around the world as large buckets. Money flows around the world moving from one bucket to the next, and as they fill up, their prices rise. The goal as an investor is to own the bucket that you think money will flow into next. On the other side, if you think money is going to be leaving a bucket, you can short it, and make money when it drops in value. As an investor you also want to pay attention to where money is flowing now, in real time. As you can see by the top two bars, bonds have had an incredible year. Their buckets have been filling up fast. Stocks (Equities) are next on the chart and they have risen this year as well, but the bucket has not seen the amount of incoming water as the bond market. The second to last line shows money markets. This is the one I want to focus on. It shows outflows of $327,107 for the year. This is an incredibly large number. If money (the water) is leaving money markets, it must flow into one of the other investment choices. 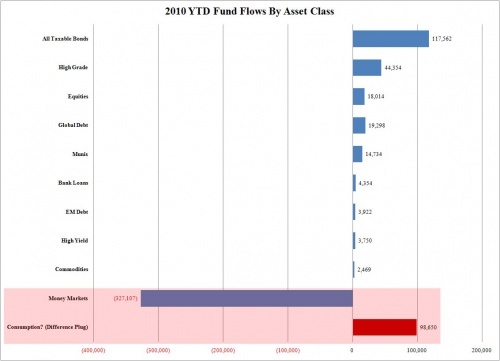 (buckets) Zero Hedge, a financial website, has noted that this outflow does not match the inflow of all the other investments. There is a $100,000 difference. People are not taking their money out of money markets and investing it in stocks or bonds. They are taking the money out and spending it. They are using the money to survive. This number is frightening, and it is draining the savings at an alarming rate. As the economy continues to deteriorate the government will continue to borrow money and bring more water into the markets. The question you have to ask yourself is, which bucket will this water flow to? We received details last week on the Federal government debt sold during the month of February. The chart below shows China selling again. They unloaded another $11.5 in United States debt. This continues to be the most important story of 2010. However, our treasury auctions have continued to run smoothly in the face of selling from our largest creditor. Who is doing the buying? Because the UK, unlike China, has no money and is currently running massive government deficits themselves. 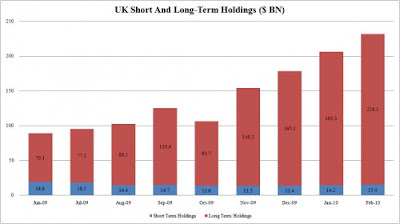 This has raised red flags everywhere from investors that can connect the pieces that the most likely buyer is the Federal Reserve who is using the UK as shelter from the public eye. I have not talked about banks failing in a while, but it is still happening every Friday night, every week. This past Friday the FDIC closed down 8 new banks. The lender that guarantees your deposits if your bank should fail (up to $250,000) is the FDIC. The FDIC ran out of money in late 2009, and is currently borrowing from the Federal Government to back your savings account. The Federal Government also does not have any money. They are currently borrowing between $200-$300 billion every month in order to avoid bankruptcy/default. By looking at recent Asian outflows out of the treasury market, many now speculate that the largest buyer of this Federal debt every month is the Federal Reserve. The Federal Reserve does not have any money. They only have a printing press.